Chandrashekhar Rao, at a high level review meeting on Friday, had stressed on the importance of giving a clean and transparent administration to the people. Chief Minister K Chandrashekhar Rao with Governor ESL Narasimhan at Raj Bhavan on Sunday. 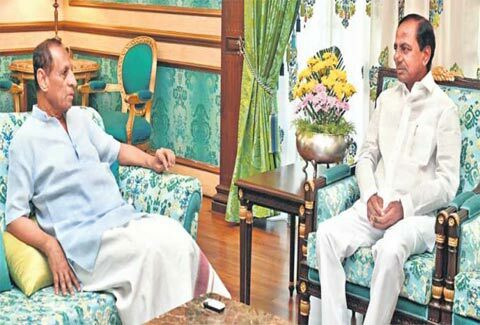 Hyderabad: Chief Minister K Chandrashekhar Rao called on Governor ESL Narasimhan at Raj Bhavan on Sunday, and is reported to have apprised him of the various initiatives of the TRS government including the move to bring in new Revenue and and Municipalities Acts. The Chief Minister, who had a two-and-half hour meeting with the Governor, is learnt to have discussed a variety of subjects. The government’s initiative to bring about structural reforms in district administration, holding of local bodies elections, measures to check graft in the Revenue Department as well as the peaceful conduct of Lok Sabha elections were part of the discussions between the two. Chandrashekhar Rao, at a high level review meeting on Friday, had stressed on the importance of giving a clean and transparent administration to the people. The Chief Minister had asserted that corruption had to be rooted out from the system, and also called for formulation of a Telangana Urban Policy. He had also underlined the need to change the nomenclature of District Collectors to District Administrative Officers, and instructed officials to examine the possibility of introducing a State Administrative Service on the lines of Indian Administrative Service.